We have been extremely fortunate to have Brooklyn based writer and editor Shoko Wanger work with us on a range of New York based portraits in the past year. She has introduced us to a group of inspiring personalities that include: artists Dez’Mon Omega Fair and Minka Sicklinger, fashion designers Mike Eckhaus and Zoe Latta, motion designer Aslan Malik and fashion stylist and art gallery sales assistant couple Andreas Kokkina and David Daniels. Born in LA, raised in Honolulu and educated in Santa Cruz, California, Shoko studied creative writing with an emphasis on fiction – since graduating, the bulk of her work has been journalistic or blog-based. She writes a daily personal blog called Sho & Tell, and has contributed to a number of publications and websites that include: Rue Magazine, Conde Nast Traveler, VICE and The New Yorker book blog. This free-spirit is always in search of the next travel adventure – in addition to yearly childhood visits to her mother’s family in Tokyo, she’s written for a music magazine in India, worked as an English teacher in Cambodia and has journeyed through Eastern Europe, New Zealand, and, most recently, Sri Lanka. Her openness to new experiences has rewarded her at seemingly every turn as she’s managed to craft a career out of connecting with fellow creatives and helping tell their tales. Here, she shares a bit of her own story with us. Coffee, most mornings at Toby’s Estate, with friends and other freelancers. Since so many of us work from home, it’s nice to have a reason to get out – we meet early, have breakfast and compare notes about what we’re working on. What do you love about your job and working freelance? It blows me away that my job is to talk to people and explore their worlds, to connect and tell stories. In my early twenties, I dabbled in a handful of different careers – and a few years later, I feel like I’ve stumbled on my dream job. Freelancing can be scary – I’m kind of figuring it out as I go – but I wouldn’t trade any of it. I feel so lucky to be able to do what I’m doing. The Grand Street Waterfront. It’s beautiful, and a five-minute walk from my apartment. It feels untouched in a way that much of the rest of the waterfront doesn’t. The bulk of my work is web-based, so my career wouldn’t exist without digital technology. Also, blogging has opened doors I never expected it would. It’s introduced me to a creative community that I love and am thrilled to be a part of. Countless meals at my grandparents’ kitchen table in Tokyo. More recently: drinking from coconuts at roadside fruit stands in Sri Lanka. All of my best travel memories seem to involve eating. Your latest artistic discovery (music, art or design)? Warpaint, thanks to my sister-in-law. Not exactly new, but I always tend to come to things late. What current global or local topics are you currently fascinated with? I’ve been completely fascinated by the #YesAllWomen movement, which has sparked some really productive debate. I’ve also always enjoyed reading as much as I can, and learning as much as I can about food politics. Three websites you – more or less – visit daily? The NY Times, The Daily at The Paris Review and Weather.com. Since moving to New York, I’ve become obsessed with hourly forecasts. What was the last great meal you ate and where? A hodgepodge chili made by friends at a cabin in upstate New York over Memorial Day weekend. Eaten on paper plates at long wooden tables, summer camp style. More people in non-traditional living spaces. I’d love to see a feature on someone with a treehouse! What’s your favorite portrait on FvF? Johanna Burke and her jaw-dropping windows come to mind – speaking of non-traditional, I believe that space was a former pasta factory. Also, the first feature I ever came across on FvF was the portrait of Sarah Illenberger. The text was in German so I couldn’t read the interview, but I loved the photos. I kept coming back to the site afterward because of that portrait. Your favorite photograph on FvF? 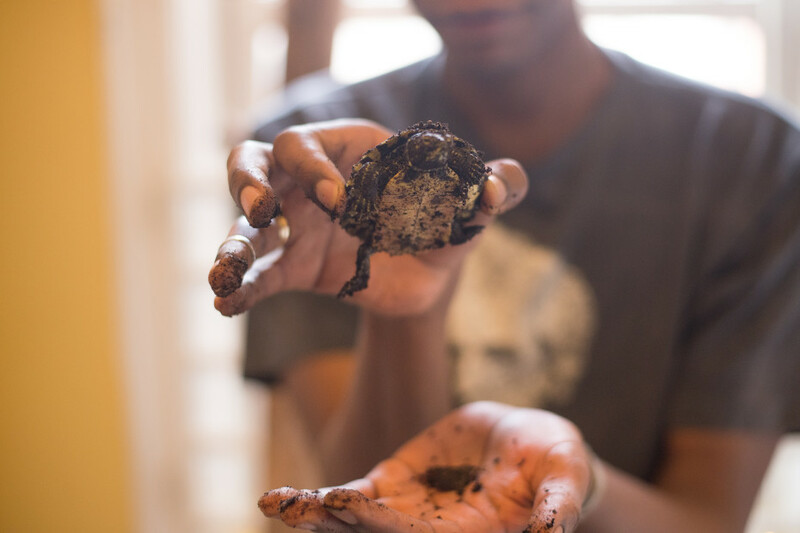 I love this one, taken by Nick Vorderman of Dez’Mon Omega Fair holding a tiny turtle he unearthed from a potted plant in his kitchen. I did the interview for that one, and it was such a surprising moment – for Nick and me, definitely, but also for the turtle, who’d burrowed so deep that Dez must have been digging around for it for a full five minutes. I’m so happy that part of the day was documented. You can find more stories about our international community of collaborators in the Meet the FvF Contributors series. And if you want to stay updated on our newest content on FvF make sure to subscribe to our bi-weekly newsletter here.